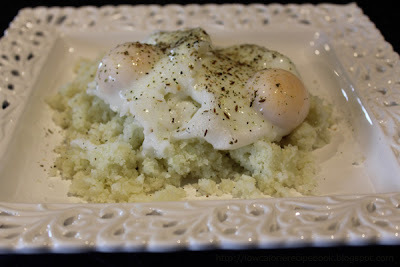 Caulirice pictured with poached eggs on top. Chop cauliflower roughly and add to food processor (florets and stalk). Serve as you would rice or couscous. Process Cauliflower in food processor until fine. Place in microwave proof bowl fitted with a lid. Microwave 6 minutes on high. Caulirice can be made a day ahead and reheated in microwave before serving. This great for using left overs the next day. Use Caulirice as a filler in fish patties too. Replace toast under poached eggs with Caulirice.